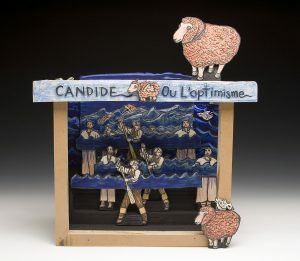 Scene from the "Candide" opera by Leonard Bernstein, one of my favorite composers. It was brilliantly performed by the Huntington Theatre Company, Boston in 2011. Thanks to them for letting me use some photo images for reference. 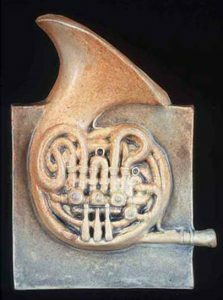 I won an Amaco Glaze award for this piece called Bon Voyage again from "Candide" by Leonard Bernstein, one of my favorite composers. It was brilliantly done by the Huntington Theatre Company, Boston in 2011. Thanks to them for letting me use some photo images for reference. One of my favorite instruments thanks to hearing it beautifully played by my Dad. 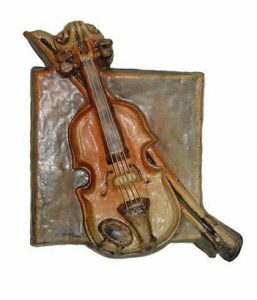 Made of stoneware with real strings threaded through, a wall tile. An instrument I love the sound of thanks to hearing it practiced in my home by my son and played in concert. I'm always listening for the horn. It's a wall tile made of stoneware, fired in reduction kiln. 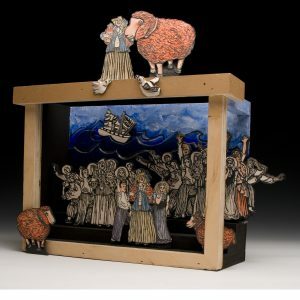 This lively experiment was inspired by the theme of the National Ceramic Conference held in Providence 2015. I love Gilbert and Sullivan and found we had an old chemistry set. I cast the test tubes and Erlenmeyer flasks in plaster for porcelain slip casting. 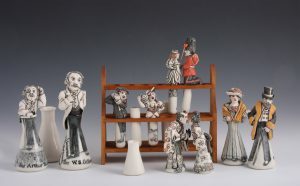 Figures made of porcelain clay. 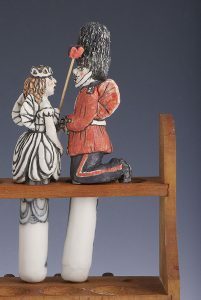 The Queen of the Fairies is falling in love with Private Willis, a palace guard in the operetta "Iolanthe" by Gilbert and Sullivan created in 1882. 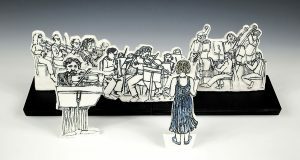 In 1885 Sir W. S. Gilbert/Lyricist and Sir Arthur Sullivan/Composer created the operetta called The Mikado, a period piece. You can see the scale with my hand. Names of the characters in different Gilbert and Sullivan Operettas I love best. Included are Sir Arthur Sullivan/composer and Sir W.S. Gilbert/Librettist. Included too are the Doyle Cartes, impresario and stewart of the operetta team of G & S and the Savoy Theatre in London.